Some people think that just having the MB badge automatically makes this a prestigious car. But Mercedes-Benz offers many other good reasons why you’ll like this. 1. Mercedes-Benz hasn’t yet finalized its pricing as the car will go on sale next year in 2019. However, they’ve been quoted saying that the price for the car will be under the $35,000 mark. 2. This comes with the new MB infotainment system call MBUX. 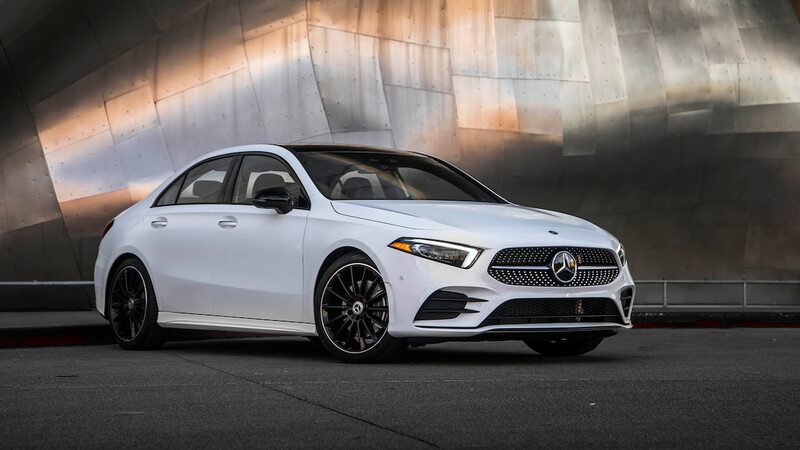 Surprisingly, Mercedes-Benz is launching the first launch of this MBUX system on its most affordable model, instead of making it first available on their top of the line models. But upon consideration, it makes sense—the owners of those other cars tend to be older, and so they may not have the patience to learn this new technology. 3. The MBUX system should be familiar to people who use Amazon Alexa, Apple Siri, and Google Assistant. It uses AI that should improve the more it interacts with you, and the updates related to non-safety issues will be automatically beamed to the A-Class owners. This MBUX also supports Android Auto and Apple CarPlay, so you can get Spotify and Waze. 4. This finally has a touchscreen. It works very well, and it reacts quickly to your swipes and taps. 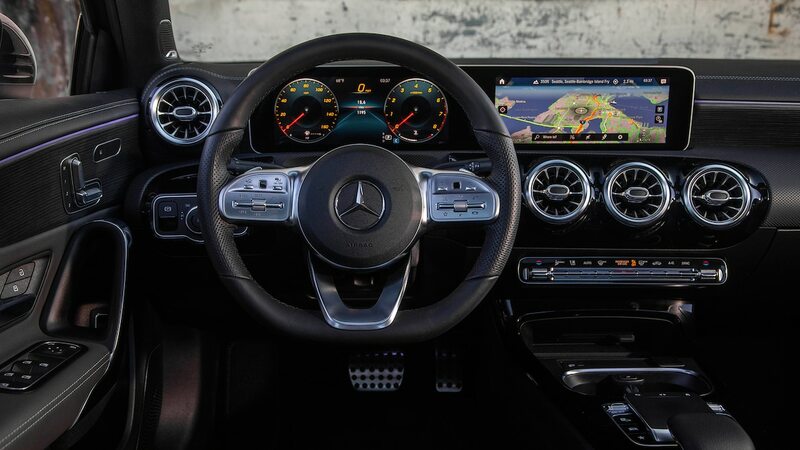 You have capacitive touch-buttons in the steering wheel like other MB models and the console touchpad has a new design. The graphics look detailed and bright. 5. Like the compact CLA sedan, the A-Class uses the same front-wheel-drive platform. It’s shorter than the CLA by more than 3 inches, yet the interior is surprisingly roomy unlike the CLA. You can actually have 2 adults in the back seat sitting comfortably. 6. The turbo lag here is virtually unnoticeable, and you have terrific throttle response. You have paddle shifters in the improved 7-speed dual clutch automatic transmission. Yet if you let it be, it short-shifts well before the 6500 rpm redline. You also don’t get the clunky low-speed performance you get from the CLA. 7. The suspension also offers a more comfortable ride, in stark contrast to the harshness of the CLA suspension. You suffer from less impact and body motion. 8. The steering offers a nice feel, with a natural weight to the steering wheel that gives you more precise handling. 9. The summer-only tires offer plenty of grip. 10. Inside, it offers enough accoutrements to emphasize that it’s an actual luxury car. The ornate vents look like those you find in the S-Class. You have ambient lighting extending across the dashboard and into the doors. Throughout the cabin, you have lots of contrasting trim. 11. The drag coefficient is just 0.22. 1. The price will certainly not remain under the $35,000 mark. With the various options available, you may find yourself paying more than $50,000 for this baby Mercedes. The Premium package that enlarges the twin 7-inch panels into 10.3-inch screens will cost you $2,100. The driver-assistance technology will cost you another $2,250. If you’re looking for the 4Matic AWD, that’ll be another $2,000. It sure makes you wonder if you may be better off with a C-Class with fewer options. 2. The MBUX system is very new, and so you need to deal with a few quirks. You can’t rename the system, so every time you mention “Mercedes” she (there’s no alternate voice) will but in and ask what you want. It can ignore commands or give weird responses to your questions. Sometimes when it doesn’t understand you it keeps on asking how she can help you. 3. In the US, the A-Class will only be available with a turbocharged 2.0-liter inline-4 engine. You get 188 horses and 221 lb-ft of torque. But in Europe, customers get 221 horsepower and 258 lb-ft of torque. 4. The look of it can be a bit bland and boring. It looks much like other sports compacts like the Honda Civic and the Volkswagen Golf, and those cars are decidedly cheaper. The design that makes the backseat functional also sacrifices the admittedly exciting look of the CLA. 5. The windshield design helps to lower its drag coefficient. But to make that possible, the windshield is narrow and very steeply raked. In conclusion, this isn’t just a more affordable entry point into the luxury market. Mercedes-Benz has managed to give us a sports sedan that drives and rides well and that’s nothing to sneer at.